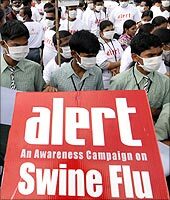 In the highest number of casualties reported in a day, 10 people died of swine flu across the country on Thursday, taking the nationwide toll to 44. Karnataka recorded five deaths due to the deadly virus that claimed its first victims in the national capital. The day also saw a spurt in fresh positive cases -- 159 -- across the country taking the total to 2,401. Pune reported 66 cases today and Mumbai 18. Samrat Pandeya, 31, died today morning at Delhi's Ram Manohar Lohia Hospital while Renu Gupta, 38, succumbed to the virus on Wednesday night, hospital Superintendent N K Chaturvedi said. The H1N1 virus claimed its 16th victim in Pune when Dipti Pawar, 27, died at the state-run Sassoon Hospital today, officials said. The virus also claimed its fourth victim in Mumbai -- the 22nd in Maharashtra -- today as Dattatraya Gawde, 35, died at a civic hospital. Karnataka accounted for the second highest number of deaths after Maharashtra as five more persons, four of them women, died in the southern state due to the disease. Ratna Nagaraj, 36, died at a private hospital on Thursday. Two women Krishnaveni, 45, and Kalpana, 36, died in hospitals on August 17 while N Prema, 23, succumbed to the virus on August 16. The other victim, Edward Mohan, 45, died in another hospital on Wednesday. Besides the casualties in Maharashtra and Karnataka, the countrywide flu toll includes five deaths in Gujarat, two each in Delhi and Chhattisgarh and one each in Tamil Nadu, Kerala and Uttarakhand.